Under the guidance and instruction of experienced instructors, you will receive a combined classroom and industry quality education of computers and information technology. Kola has over 30 years experience in technology. His background stems from prominent positions such as computer and information technology expert, certified A+ / Network instructor, computer educator, network engineer, and entrepreneur; a former computer educator for several institutions including Oakland Unified District, Berkeley Adult, and Contra Costa College. He was the first Computer Repair Instructor hired by Oakland Unified School District, designed the A+ Certified curriculum, educated his students, and managed it for the entire district. He worked as a PC Specialist for John F. Kennedy University, serviced computer equipment and network for all JFK University campuses in San Francisco bay area. Established his own computer company (Micro-Easy Computer Enterprises) in 1985 for Computer Sales, Service & Training: managed and secured computer service contracts from major companies such as Sacramento Municipal Utility District. In 2000, he incorporated and expanded the company with a BPPE approved institution (Micro-Easy Vocational Institute) which provides Computer and Information Technology skills, as well as job placement assistance for students. He served as vice president of Richmond Lions Club International, and Director of El Sobrante Chamber of Commerce. Over the years, Kola has inspired and motivated students through training techniques that have proven to be efficient in both education and in the workforce. 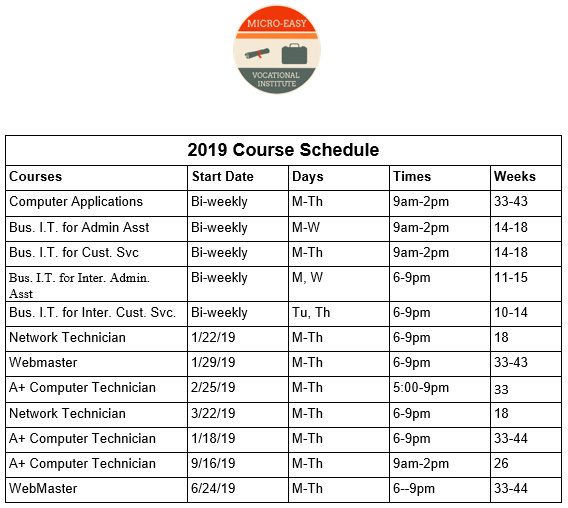 He continues to provide the most up-to-date curriculum with the assistance of his instructors to meet the job demands in the Computer and Information Technology industry. He is an alumni of University of San Francisco with a degree in Information Management Systems. We hire instructors that meet our qualifications on a contract basis for the entire length of the course subject to renewal on successful performance and enrolled students. The successful candidate must have a minimum of three years of experience, education, and training in current practices of one of the courses offered by Micro-Easy Vocational Institute: A+ Certified Technician, Computer Applications, Network technician, WebMaster. Adult learning knowledge required. Demonstrate ability to utilize interpersonal, written and verbal communication skills, and group facilitator skills. The person must have the ability to organize and present material in the classroom, be sensitive to student needs, and committed to the educational philosophy of Micro-Easy Vocational Institute. The individual must be articulate, have a professional appearance, and a problem-solving attitude.